Pain experienced immediately following scoliosis surgery is described as “severe” and “a challenge for the anesthesiologist.” (Borgeat and Blumenthal 2008) The severity of pain is combated with increasing the amounts of drugs used, which may include, intravenous morphine, acetaminophen, ketorolac, methocarbamol, and diazepam. The more severe the acute pain following surgery, the greater the likelihood that it will give way to chronic, debilitating pain. Debilitating pain is defined as pain which limits one’s ability to perform daily activities, such as walking to the bathroom or eating a meal. Recently it was found that one year after surgery, 42% of adolescents experienced debilitating pain. 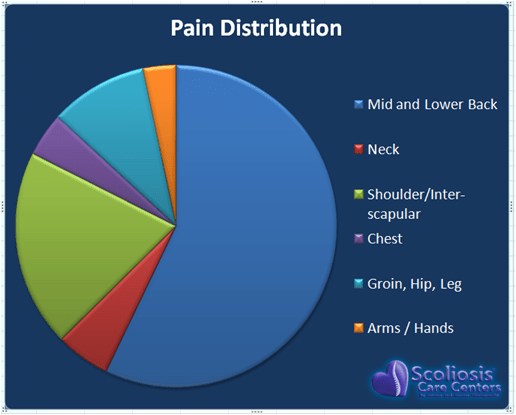 This compares to only 5% experiencing serious pain prior to surgery. Children with a chronic pain rating of less than 4 out of 10 were not counted, and the actual incidence of chronic pain post scoliosis surgery may be significantly higher. (Chidambaran et al. 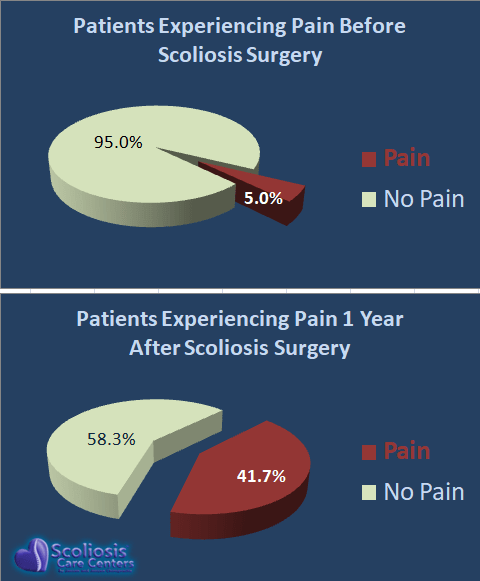 2017) This is contrary to the common claim that recovery from scoliosis surgery is complete in 3-6 months. Number of Vertebrae involved: The more vertebra involved in the scoliosis surgery, the higher the rate of chronic and persistent pain. Prior Pain: Having pain in the spine prior to surgery is predictive of higher risk for having pain 1 year after the surgery. A High “Child Anxiety Sensitivity Index”: This is a standardized questionnaire that measures the anxiety sensitivity of a child; the higher the score, the greater the risk for chronic pain persisting beyond 1 year. It is often believed that scoliosis surgery is the only option for treating scoliosis. This is simply not the case. Scoliosis Care Centers offers a variety of nonsurgical treatment options with high rates of success treating mild to severe scoliosis. For more information on the misconceptions about scoliosis please read Are Wrong Beliefs About Scoliosis Hurting our Children. Borgeat, Alain; Blumenthal, Stephan (2008): Postoperative pain management following scoliosis surgery. In Current opinion in anaesthesiology 21 (3), pp. 313–316. Chidambaran, V.; Ding, L.; Moore, D. L.; Spruance, K.; Cudilo, E. M.; Pilipenko, V. et al. (2017): Predicting the pain continuum after adolescent idiopathic scoliosis surgery. A prospective cohort study. In European journal of pain (London, England) 21 (7), pp. 1252–1265. DOI: 10.1002/ejp.1025.